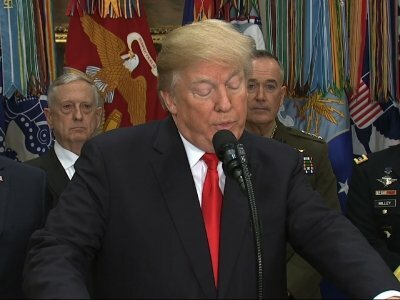 WASHINGTON (AP) — President Donald Trump on Tuesday signed into law a sweeping defense policy bill that authorizes a $700 billion budget for the military, including additional spending on missile defense programs to counter North Korea’s growing nuclear weapons threat. But there’s a catch. The $700 billion budget won’t become reality until lawmakers agree to roll back a 2011 law that set strict limits on federal spending, including by the Defense Department — and they haven’t yet. The law caps 2018 defense spending at $549 billion. Before he signed the bill at the White House, Trump called on Congress to “finish the job” and eliminate the cap on defense spending. Temporary government funding is set to run out on Dec. 22, the deadline for lawmakers to send the White House a broader government funding bill or risk a partial government shutdown. Many Republicans favor easing the caps for defense spending only. Democrats also want increases in other government spending. Trump released a lengthy statement after signing the bill in which he complained that multiple provisions amounted to congressional overreach that he argued infringed upon his executive authority. Trump used the signing ceremony to address a separate threat, repeating his call to overhaul U.S. immigration law following Monday’s blast in a New York City subway passageway. It was the second incident authorities have described as terrorism in New York City since late October. The president noted that the individual involved in October’s deadly incident came to the U.S. through the visa lottery program, and that the individual in this week’s attack arrived based on a family connection to an American citizen. The 2018 defense bill allots about $634 billion for core Pentagon operations and nearly $66 billion for wartime missions in Afghanistan, Iraq, Syria and elsewhere. The funding boost pays for more troops, jet fighters, ships and other weapons needed to halt an erosion of the military’s combat readiness, according to the bill’s backers. It also grants troops a 2.4 percent pay raise, slightly higher than what the Pentagon sought. Trump’s 2018 request sought $603 billion for basic functions and $65 billion for overseas missions. The defense legislation includes $12.3 billion for the Pentagon’s Missile Defense Agency and orders a more rapid buildup of the nation’s missile defense capabilities “as we continue our campaign to create maximum pressure on the vile dictatorship in North Korea,” Trump said. “We’re working very diligently on that, building up forces,” Trump said. Trump thanked the bill’s chief sponsors, House Armed Services Committee Chairman Mac Thornberry of Texas, who joined Trump at the White House, and Senate Armed Services Committee Chairman John McCain of Arizona, who did not. McCain issued a written statement afterward that called on Congress and the White House to work “expeditiously” on a budget agreement that secures the increased $700 billion for the military following years of spending cuts.